Chickens are among the most intensively farmed animals, while the consumption of eggs also has a significant impact on their welfare. Chickens have to undergo countless painful procedures in order to be adapted to the unnatural conditions in which they are kept. ProVeg shines a light on the egg industry and suggests some healthy alternatives. Chickens spend a significant portion of their time foraging, which includes wandering around, scratching, and pecking at the ground.3Hoy, S., (ed) (2009): Nutztierethologie: 35 Tabellen. UTB Agrarwissenschaften, Veterinärmedizin 3312. Stuttgart: Ulmer. pp. 210 They take regular dust, soil, or sand baths, and groom their feathers regularly to stay clean and healthy. Most of the time, chickens stay on the ground, but they fly up into trees or onto other elevated perches to rest or when they sense danger. Chickens are clever and sensitive individuals with distinct personalities. Their communication is complex, with at least 24 different types of vocalisations recorded.4Collias, N. E. (1987): The Vocal Repertoire of the Red Junglefowl: A Spectrographic Classification and the Code of Communication. The Condor, no. 89 (n.d.): pp. 510–524. Research has shown that the cognitive capabilities of chickens are comparable to mammals such as cats, dogs, and even primates.5Smith, C. L. & S. L. Zielinski (2015): Schlaue Hühner. Available at http://www.spektrum.de/news/schlaue-huehner/1342910 [03.03.2018] For example, chickens are capable of comprehending object permanence (understanding that objects outside of view still exist), which exceeds the cognitive abilities of infant humans. Newborn chicks are able to perform complex mathematical operations, distinguish quantities, and tell left from right – just like humans.6Rugani, R., L. Fontanari, E. Simoni et al. (2009):. Arithmetic in Newborn Chicks. Proceedings of the Royal Society B: Biological Sciences 276, no. 1666 (July 7, 2009): pp. 2451–2460. There is also strong evidence of the emotional capacities of chickens. Mother hens display their capacity for empathy when they observe their chicks experiencing stress and, as a result, exhibit signs of stress themselves.7Nature (2011): Animal behaviour: Chickens feel for each other. 471, no. 7338 (March 17, 2011): 268–268. doi:10.1038/471268c. 8Edgar, J.L., E.S. Paul & C.J. Nicol (2013): Protective Mother Hens: Cognitive Influences on the Avian Maternal Response. Animal Behaviour 86, no. 2, pp. 223–229. 9Edgar, J. L., J. C. Lowe, E. S. Paul, et al. (2011): Avian maternal response to chick distress. Proceedings of the Royal Society of London B: Biological Sciences. 278, p.3129–3134 Additionally, chickens forge strong friendships and prefer the company of certain chickens over others.10Hauser, J. & B. Huber-Eicher (2004): Do Domestic Hens Discriminate between Familiar and Unfamiliar Conspecifics in the Absence of Visual Cues? Applied Animal Behaviour Science 85, no. 1–2 (January 2004): pp. 65–76. The egg industry makes a clear distinction between laying hen breeds and broiler chickens which are raised for meat. Laying hens are bred to lay as many eggs as possible, and are kept under artificial lighting designed to further increase laying rates. The result is that these ‘high-performance’ hens lay an average of 300 eggs per year.11Hoy, S., (ed) (2009): Nutztierethologie: 35 Tabellen. UTB Agrarwissenschaften, Veterinärmedizin 3312. Stuttgart: Ulmer. p. 204 Like their wild relatives (red junglefowl), chicken breeds that have not been genetically selected for their high egg yield lay fewer than 40 eggs per year. As a result of this unnaturally high laying rate, the bodies of laying hens are quickly exhausted. Accidents, diseases, bone fractures, and inflammation of the oviducts are commonplace, as is premature death. Worldwide, over 7 billion chickens are kept inside egg factories, laying more than 1.3 trillion eggs per year. 500 million chicken are kept in Europe alone.12Food and Agriculture Organization of the United Nations (2017): FAOSTAT Statistics Database. Available at http://www.fao.org/faostat/en/#data/QL [03.03.2018] While conditions vary around the world, most hens are kept in one of four types of husbandry settings: cages, barns, free range, or organic husbandry systems. In most egg factories, chicks have their beaks trimmed at a young age in order to prevent them from pecking at and cannibalising each other as they grow older, behaviour which is triggered by high stocking densities.22Bilcík, B. & L. J. Keeling (2000): Relationship between Feather Pecking and Ground Pecking in Laying Hens and the Effect of Group Size. Applied Animal Behaviour Science 68, no. 1 (May 5, 2000): pp. 55–66. Debeaking modifies the chicks’ bodies to suit an unnatural and stress-inducing environment, rather than modifying the environment to accommodate the basic needs of the chickens. Because they cannot lay eggs, and their breeding makes them unprofitable to raise for meat, male chicks are considered worthless to the egg industry. Consequently, on their first day of life, male chicks are separated from their sisters and killed. The two most common methods of slaughter are suffocation or being shredded alive in a grinder. The egg industry maximizes its profits by keeping only the most productive laying hens. However, the laying rates of hens naturally decline as they age and laying hens across all farming systems are slaughtered after just one year. They are then replaced with younger, more productive individuals. This turnover leads to the slaughter of several billion hens per year. According to chicken industry statistics, many hens do not even survive long enough to be slaughtered after their first year. Around 10% die during their first year of life as a result of the strenuous conditions of egg production. This loss is referred to within the industry as ‘shortfall’ and calculated as a ‘loss of productive days’. Annually, the world’s population consumes about 200 eggs per capita.24International Egg Commission (2015): Egg Industry Review 2015. Available at http://www.internationalegg.com/wp-content/uploads/2015/08/AnnualReview_2015.pdf [03.03.2018] The consumption of eggs is associated with health risks. For example, eggs have a high cholesterol content and can promote atherosclerosis, which increases the risk of cardiovascular disease. 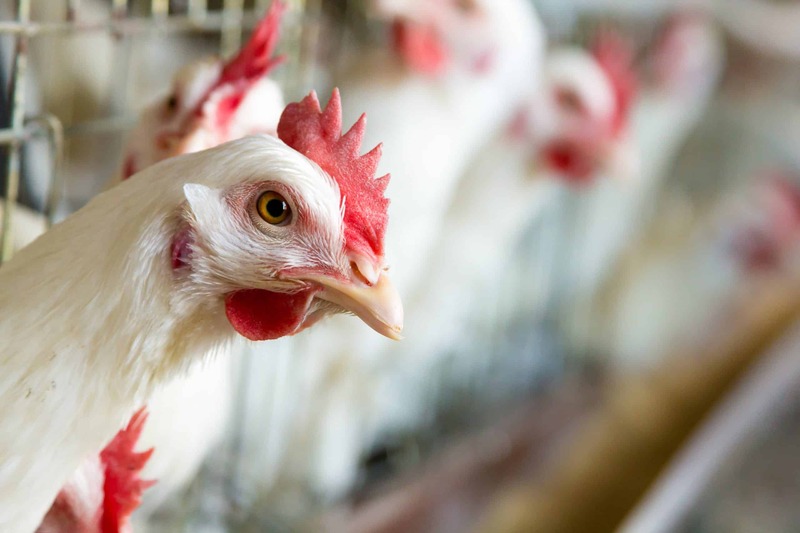 Due to the poor conditions that chickens live in, eggs are the perfect host for salmonella, which can cause diseases in humans and other animal species. Food scandals such as eggs contaminated with dioxin or fipronil present another reason why more and more consumers are reducing their egg consumption or switching completely to healthier plant-based alternatives. Eggs are an important ingredient in many cuisines, whether for baked goods and desserts or for mayonnaise and hollandaise sauce. However, due to the industrial production methods used, eggs come at a significant cost to animal welfare, the environment, and our health. There are now healthier, plant-based egg alternatives for every purpose. These include applesauce or bananas for baking, and kala namak for a typical egg flavour, as well as commercially available alternatives. ProVeg presents the best plant-based egg alternatives and explains how to make creative use of them in the kitchen. ProVeg does not only point out healthy, cruelty-free alternatives but also makes them more readily available. ProVeg supports and facilitates a range of vegan events throughout the year, from annual happenings such as VeggieWorld and VegMed to important one-off events such as CEVA trainings and legal and political symposiums. Furthermore, ProVeg advises and supports innovative companies that want to enrich the veggie market with their products. This ranges from mentoring early-stage start-ups to consulting for major international supermarket brands and administering the V-Label, which guarantees that a product is either vegan or vegetarian. Find out more about what we are doing to help the world transition to a more plant-based society and economy that are sustainable for humans, animals, and our planet. 4. ↑ Collias, N. E. (1987): The Vocal Repertoire of the Red Junglefowl: A Spectrographic Classification and the Code of Communication. The Condor, no. 89 (n.d.): pp. 510–524. 6. ↑ Rugani, R., L. Fontanari, E. Simoni et al. (2009):. Arithmetic in Newborn Chicks. Proceedings of the Royal Society B: Biological Sciences 276, no. 1666 (July 7, 2009): pp. 2451–2460. 7. ↑ Nature (2011): Animal behaviour: Chickens feel for each other. 471, no. 7338 (March 17, 2011): 268–268. doi:10.1038/471268c. 8. ↑ Edgar, J.L., E.S. Paul & C.J. Nicol (2013): Protective Mother Hens: Cognitive Influences on the Avian Maternal Response. Animal Behaviour 86, no. 2, pp. 223–229. 10. ↑ Hauser, J. & B. Huber-Eicher (2004): Do Domestic Hens Discriminate between Familiar and Unfamiliar Conspecifics in the Absence of Visual Cues? Applied Animal Behaviour Science 85, no. 1–2 (January 2004): pp. 65–76. 22. ↑ Bilcík, B. & L. J. Keeling (2000): Relationship between Feather Pecking and Ground Pecking in Laying Hens and the Effect of Group Size. Applied Animal Behaviour Science 68, no. 1 (May 5, 2000): pp. 55–66.